The LotusGrill has a built-in, battery-operated fan, which supplies the charcoal with air. As such, the charcoal is permanently wellaerated, which means the BBQ can be lit without virtually any smoke. The BBQ is ready to use in just 3-4 minutes. Precise temperature control is possible thanks to the switch, which allows the fan to be infinitely adjusted. The LotusGrill has a built-in, battery-operated fan, which supplies the charcoal with air. As such, the charcoal is permanently wellaerated, which means the BBQ can be lit without virtually any smoke. The BBQ is ready to use in just 3-4 minutes. Precise temperature control is possible thanks to the switch, which allows the fan to be infinitely adjusted. The more air blown into the charcoal, the hotter it burns. Flying sparks or escaping embers are reduced to a minimum as combustion takes place in a closed container inside the BBQ. The double-walled construction of the LotusGrill combined with the closed charcoal container and lockable grill grid guarantee a safe and fun BBQ experience. Any grease dripping from the food is guided via the stainless steel plate in the middle of the grill grid and collected in the inner bowl of the LotusGrill and therefore does not come into contact with the charcoal. This reduces the amount of smoke which the BBQ produces to a minimum. The LotusGrill now allows the BBQ master to finally barbecue right where the others are The Innovation eating, so he or she can enjoy the party instead of standing off to the side. The BBQ can be completely disassembled after use and is easy to clean. A specially-developed, extensive set of accessories rounds off the LotusGrill&apos;s product range. 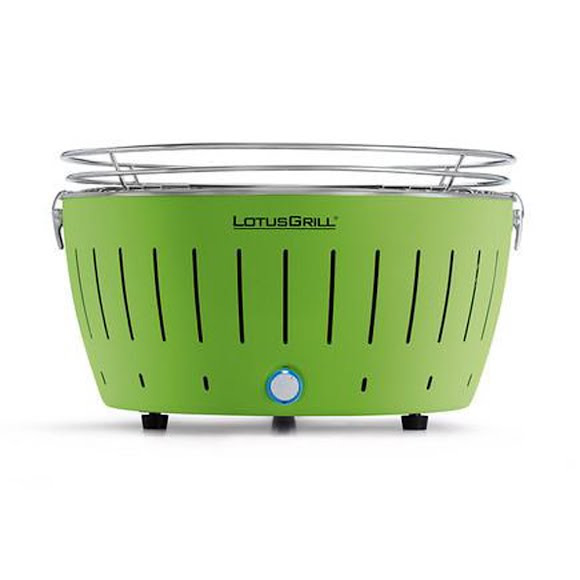 The LotusGrill is the fun, fast and safe way to barbecue. To ensure the best possible results and minimal smoke, we recommend using the LotusGrill safety fuel gel and LotusGrill beech charcoal.